Habit 1 stresses a person to take responsibility for their life. They use a weather illustration to make a point. Everyone carries their own weather. We make choices that determine if it will be a sunny (positive) day or a rainy (negative) dreary day. For example, when you choose to go to bed at a reasonable hour and get the sleep, food and exercise your body needs, you made a decision to give youself a chance to start the next day in a positive light. When you do small acts of kindness, look at the glass as half full, keep a promise you made, spend time in God's Word you make choices that prepare your life for warmth and light. These actions fall under the term Proactive; choices made that you have control over; that help you create your own weather, keeps you focused and centered. When you respond to a situation without taking time to think about how to respond, or not understanding why you are responding in a certain way, you are being reactive. When you are reactive you are letting circumstances control your responses, which is easier to put the blame on others. When you act proactively, you examine or have predetermined responses on how you would behave in certain situations. It means anticipating situations and imaging the responses you could make, then determining which is the most appropriate response at that time. Does it mean you will always have the correct response all the time? No. But, you will have better control over your actions and learn how to best respond in the future. For the most part, there is always a moment between the time we are confronted with a decision and the time we choose to respond. Use the space between the stimulus and the response to apply a principle which will bring about your desired result. Reactive people allow outside influences (moods, feelings, and circumstances) to control their response. They have not taken time to think about their response nor a desired outcome. Proactive people pause to choose their response based on principles and desired results. 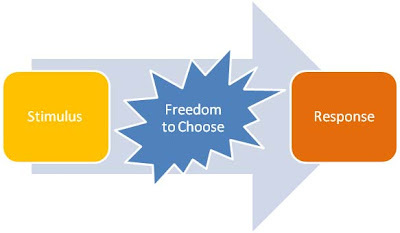 Their freedom to choose expands as they wisely consider many options of response. You may be saying, there isn't that much time for me to consider all the options before I need to make a response. Unfortunately, this is seldon the case. It is more like we have not trained ourself to be "quick to listen, slow to speak and slow to become angry" (James 1:19). It is more like, "I am caught off guard with this situation, so to defend my pride, I say or do something that discredits the person or situation and makes me look good." Self awareness - one can stand apart from one's thoughts and feelings and is able to examine and change them. Conscience - one is able to feel the inner prompting of what is right and wrong in something they are about to do. Imagination - one can think ahead; visualize alternaive responses to obtain a desired result. Willpower - the ability to act on one's decisions; to set and achieve meaningful goals in one's life. Think of a situation where you consistently respond in a reactive way (lose patience, avoid confrontation, blame someone, lack discipline). Consider why you react in this way? What is a better, more effective way to respond? Is there a response that would achieve the positive outcomes you desire. What is your commitment level to respond in this way next time you are confronted with this situation? Use the gifts God has given you.